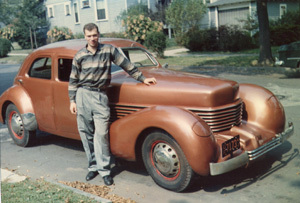 Here's me and my everyday transportation in 1958. This was Cord #3. The photo was taken in Elizabeth, New Jersey, where I had just landed my first full-time job. The Cord started nearly every day, and ran most of the time. Those blackwall truck tires were all we could get then. The interior was a wreck, and some of the 'chrome' was aluminum paint, but I loved it dearly. Today this car --- 810 1776A --- is owned by Ed Lehman in New Jersey, and is gradually being restored.